A cell from the innate immunity (phagocyte, left), with a phagosome containing a foreign particle, activates adaptive immunity cells, which will be the organism second line of defense against the pathogen (right). Nicolas Manel and his research group are studying the principles and mechanisms of innate immunity in humans and its impact on adaptive immunity using HIV and other models. 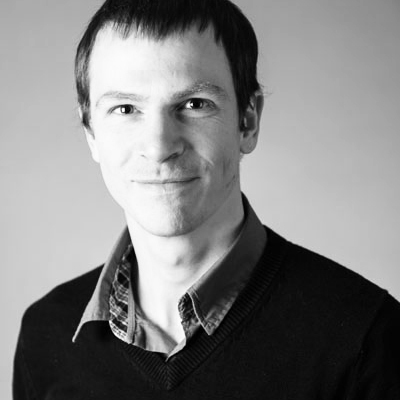 Nicolas Manel’s lab is interested in understanding the principles of innate immunity in humans and how it can shape adaptive immunity. Innate immune responses are considered the first line of defense against harmful conditions, including viral infections and cancer. 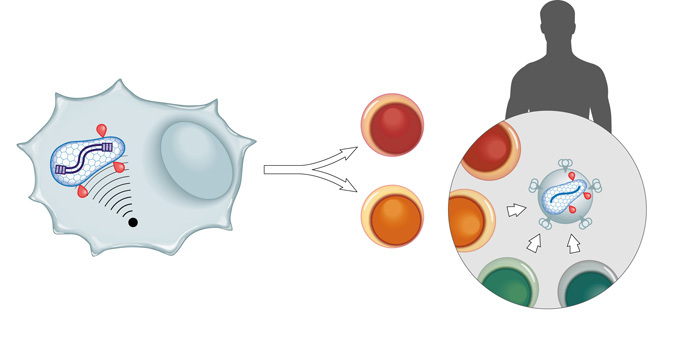 In the immune system, human dendritic cells play a key role in the control of these responses and are a promising component of rational immune therapies. Indeed, dendritic cells couple innate and adaptive responses: they have the ability to detect and sense injured tissues, cellular fragments and pathogens and they associate this sensing with the activation of adaptive T lymphocytes. Nicolas Manel’s lab studies HIV, an important human pathogen that causes AIDS, as a model to understand the regulation of innate immunity in human dendritic cells. Human dendritic cells do not normally sense HIV-1. This lack of sensing is linked to the inability of HIV-1 to efficiently replicate in dendritic cells. Indeed, and counter-intuitively, artificially increasing HIV-1 infection in dendritic cells leads to an innate immune response against the virus. This shows that the human immune system is equipped with a cryptic sensor for HIV-1 replication, but HIV-1 evades it. Projects in the lab aim at understanding how this sensing mechanism operates and whether it could be engaged therapeutically or in vaccines. Some of the projects developed in the lab include the study of viral determinants of sensing in HIV, of the cellular mechanisms of sensing and of the impact of the innate sensing and dendritic cells on adaptive immunity. To achieve these aims, Nicolas Manel and his team utilize a number of molecular and cellular approaches in the context of immunology and virology, including RNAi, screens, imaging and gene expression analysis.